I have always been stubborn, and I have never been able to run. As to stubbornness: I have stood my ground, bruised and bloody-minded, so many times over so many things that the specifics blend into each other; a plate of vegetables I refused to eat at age six resides in the same part of my brain as an apology I refused to make at age twenty seven. As to running: I have tried it so few times with such pitiful results that the specifics are horribly stark; a single night-excursion with A. through the stony streets of Jerusalem, ending mere minutes later in shame and sweat and heart palpitations, is as vivid as if it had been stitched into a medieval tapestry and hung on my wall. A few years ago, when Ross and I lived in Boston and I volunteered as a gallery guide at the Harvard Museum of Natural History, we used to go there fairly often to listen to public lectures in the evenings. The details of most of the talks we attended—on, for instance, the physiology of singing insects or whether morality is learned or innate—are lost to memory. But one event in particular impressed me so much that I still think about it from time to time, and it has been on my mind this week. It was by a Harvard researcher named Daniel Lieberman, an anthropologist who studies human evolution. At the time, Lieberman was obsessed with the question of how and why we run. The conventional wisdom about locomotion, he argued—that early hominids whose bodies were more suited to bipedalism were the ones who survived when they left their shady tree-dwelling lives to forage for food on the open savannah, and that the human ability to run was simply a byproduct of the ability to walk—was all wrong. Listen, he said: Our cousins the Australopithecines could walk on two legs, and their bodies—hunch-shouldered, short-legged—were nothing like those of the genus Homo. Plus, Australopithecines continued to lead a partially arboreal existence for millions of years, even after they evolved to be bipedal. Walking, Lieberman announced to the room, didn’t bring us down from the trees, and it didn’t give us our human shape. Only look: The human body is exquisitely well-designed to run. It has long, elastic tendons in its legs and feet that store energy like springs when compressed, something we do much more when we run than when we walk. It has large gluteus maximus muscles that pull our torsos backwards and keep us upright when we lean crazily forward into the off-balance pitch that starts each new step of a run. It is relatively hairless, and can sweat—both adaptations that allow us to release the heat of extreme exertion. The reason we evolved to lope, dash, scamper, gallop, hurtle across this great green Earth? Well, the anthropologist grinned, we hadn’t yet invented the bows and arrows that would enable us to kill over long distances; we hadn’t yet tamed the wild horses that would one day carry us close to fleeing animals. We learned to run, he argued—and run, and run, and run—so we could hunt prey to exhaustion, track it for hours if necessary, past the point at which a quadruped (built to gallop only for short distances) would have to stop to pant. And then we would stop running, too, and have done with it. I remember being struck, at the time, by how extraordinarily steely this seemed—how the idea of it made me simultaneously marvel at and recoil from my strange, inherited human self. If this was true then we were born to conquer; born to do it without tools, without thought, and without guile, but through a simple act of complete and total obstinacy. To run, it seemed, was to be stubborn. For thirty-two years I have lived with both these ideas about myself. But (ask a Harvard anthropologist!) being deeply contradictory truths, perhaps it should not so much surprise that one of them would someday fall. 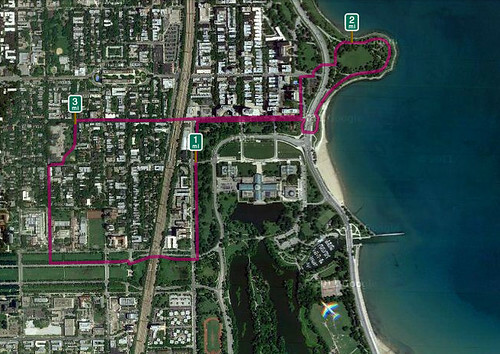 So far this week, heart and legs and mind stronger than they have ever been from a summer’s worth of field work, I have run a total of nine miles—by the lake, at the gym, through the streets of my neighborhood in Hyde Park. It isn’t much, I know; nine miles is far from an endurance-run across the Kalahari. There is a long, long way to go. But I have not stopped to pant. I am persisting. I am claiming my strange, inherited human self. And one of these days I’m going to outlast whatever it is I’m hunting, and have done with it. This entry was posted on August 31st, 2011 at 10:30 pm and is filed under Shorts. You can follow any responses to this entry through the RSS 2.0 feed. Both comments and pings are currently closed. Funny, I just started running again this week now that I don’t have daily hikes. Now all I’ll be able to think about is chasing down antelope, some sort of evolutionary debt I need to repay. Ah what a coincidence! That idea that human are made to run came up this weekend when we were watching our friends’ one year old daughter learn to walk. Her parents would sit a few feet apart, one parent would prop her up on her feet and sort of pitch her at the other one, and she would stagger forward and fall into a big hug. She got a lot better at this over the course of the weekend, but we all observed that things seemed to be most promising when she was moving more quickly. Slow steps meant unsteadiness and potential for falling and tears. It was all pretty adorable. Hmmm… In a strange way, it seems Springsteen got it right, though he surely wasn’t singing about tracking antelope. I was put off running in second grade, when I fell onto the track at the starting blocks and ground cinders into my knees. It took two years for those cinders finally to be gone.